This book contains the prayer for every day of the liturgical year. In the rhythms and events of time the Church wants to remind us of and to relive the mysteries of our salvation. 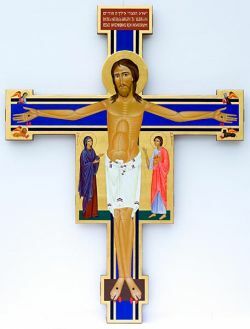 At the center of the liturgical year is placed the triduum of the Lord’s crucifixion, burial, and resurrection, which culminates on Easter Sunday. The three days of the Passion and Easter are preceded and prepared by Lent, a time of conversion, hence of struggle against the temptations of the devil, a time of fasting, vigil, and prayer, and are followed by Eastertide, the joyous celebration of the Lord’s Resurrection, a celebration that reaches its fullness at Pentecost, commemoration of the gift of the life-giving Spirit to the Church from the Risen Lord. Next to the Easter cycle there is the cycle of fixed feasts: Christmas and Epiphany. They too are preceded by a season that is proper to the Western liturgy, which proclaims the Lord’s glorious coming. Expectation and vigilance characterize this time, called Advent, which invokes the Parousia and recalls the manifestation of the Word made flesh that has already occurred in the fullness of time (cf. Gal 4, 4). Advent is traditionally the beginning of the liturgical year, but in fact, according to the most ancient sources, it is its crowning. This is also suggested by what the constitution of Vatican II Sacrosanctum Concilium 102 says: “During the annual cycle the Church unfolds the whole mystery of Christ, from the incarnation and birth to the ascension, to the day of Pentecost, and up to the awaiting in blessed hope of the Lord’s coming”. The event that is at the center of the celebration of Easter is really the Lord’s glorious coming at the end of time: the Lord Jesus Christ is about to come! the Son of man comes in glory! the day of the Lord is near! In the thirty-four weeks of ordinary time, which is also called the time of the Church or “per annum”, no particular aspect of the Christian mystery is celebrated; the Christian walks toward the Father in the light of Christ and with the power of the Holy Spirit, recalling every week on Sunday, the Lord’s day, his resurrection, and thus being reminded also of his glorious coming. In this journey the commemoration of the saints manifests their communion with the pilgrim Church in intercession and in the divine life; the feast of the Transfiguration, 6 August, in the middle of summer, is like an epiphany in Christ of what occurs in the life of the Christian day by day: his transfiguration in the image of Christ (cf. 2 Cor 3, 18). The introductions to morning and evening prayer, the responses, and the orations vary in obedience to the liturgical season being lived.